Akihabara has a reputation as Japan’s electronics town. The area became famous after World War II as it was THE place in Tokyo to buy black market radio and electronic equipment. Nowadays, Akihabara (or Akiba as it is commonly referred to by the locals) is synonymous with the otaku subculture. Over the years Akiba has evolved into a hub for all things manga, anime and gaming related; so when you throw modified cars into the mix, you get something very unique to Japan: itasha. In the world of the Japanese car scene, the word itasha means “painful car”. 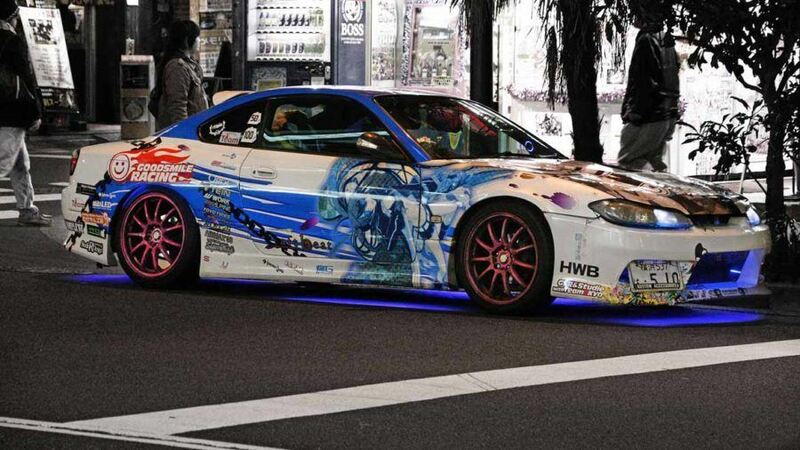 Whether it’s painfully embarrassing to be seen in or painful on the wallet due to the cost of modifying the vehicle; itasha cars are always decorated with the owner’s favourite manga (usually cute/kawaii girls) and adorned with visually extreme modifications, including LED lights and aerodynamically-challenged bodykits. It’s a subculture of the car scene that is rarely seen outside of a few major cities in Japan. 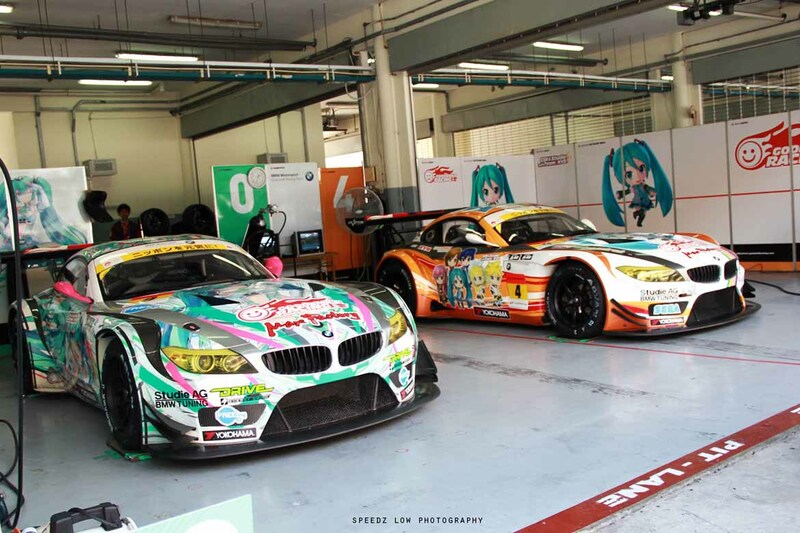 However, in recent years the itasha style has begun to be adopted by the mainstream (in Japan at least); with high profile domestic race cars combining wild designs and sponsorship tie-ins (see Goodsmile Racing’s SUPER GT entries). With many manga and anime set in and around the Akihabara area of Taito, it’s only natural for the locals to get involved. The most popular theme at the moment is Love Live! School Idol Project. The story focuses around nine girls who attempt to save their school (located in the Kanda/Akihabara area) by forming an Idol group, which were made famous by Akihabara’s own AKB48 (you can read more about AKB48 here). With nine characters to choose from, otaku have quite a few options when it comes to decorating their cars with Love Live! decals. Ensuring you don’t choose the same character as your friend must be high on your list of priorities; you wouldn’t want to cruise around looking like you’re part of the Hanayo Koizumi fan club, would you? Well, it didn’t stop the Toyota Celica and Nissan S15 above (obviously Koizumi-chan fans), so I guess you just stick to your guns and be passionate for whomever you like, regardless of what others think – and that’s what that makes otaku, otaku. It’s also the ethos behind all modified cars. Without trying to sound all Jerry Springer about it; whether you love or hate these cars, you have to respect them. I guess the UK alternative would be a Vauxhall Astra with artwork from the Beano down the side; and when you imagine that in your mind’s eye, it becomes distinctly less cool – and you begin to understand why this style is quite niche. What surprised me the most was that these aren’t just cheap cars with cheap aftermarket parts and a ton of stickers. Watching a Nissan Silvia S15 trying to parallel-park with what sounded like the most aggressive of limited-slip differentials, you begin to realise that despite looking like they’ve let their 12-year old child loose with the vinyl cutter, many of these cars could handle themselves in a kaido battle on the Wangan or racing down the touges of rural Japan. Of course, they’re not all Japanese automotive royalty and there are many wagons and kei class vehicles – but you have to start somewhere! Moped or mobile movie theatre? It isn’t just the cars. Motorcycles don’t escape the itasha treatment either. Scooters and bikes fitted with LEDs and TV screens also line the streets, grabbing attention from adoring otaku and puzzled tourists alike. There was a time when the term “otaku” was a negative, condescending slur against this kind of behaviour; nowadays it’s almost a badge of honour for the scene they are involved in and the community they belong to. 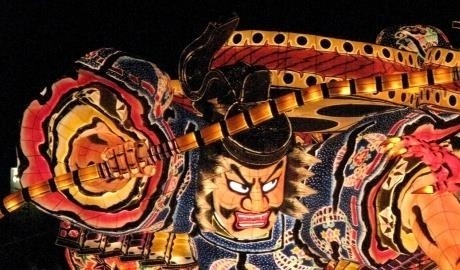 Even outside of Japan, the “otaku” title has been adopted by manga and anime fans to describe their passion for these Japanese subcultures. 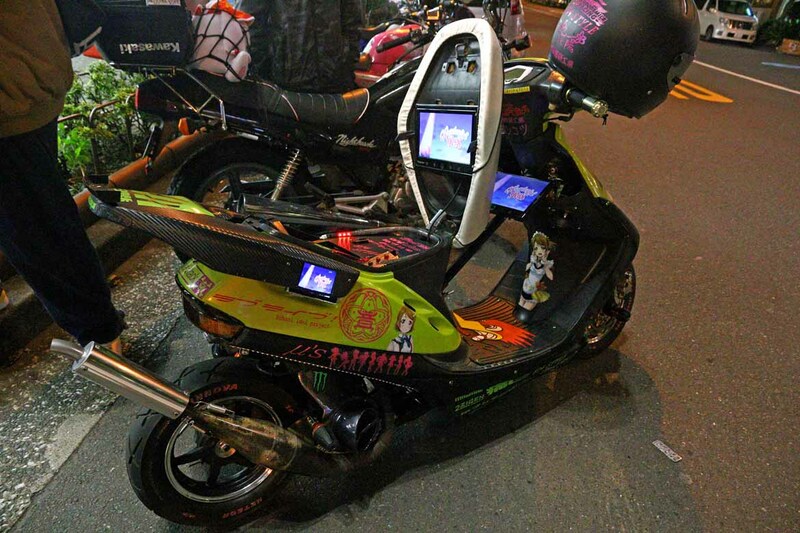 Otaku are portrayed as a shy, lonely bunch; so to decorate your car or bike in a way that is designed to attract attention is quite a breakaway culture. It is also a great way of meeting like-minded people without having to start a conversation. 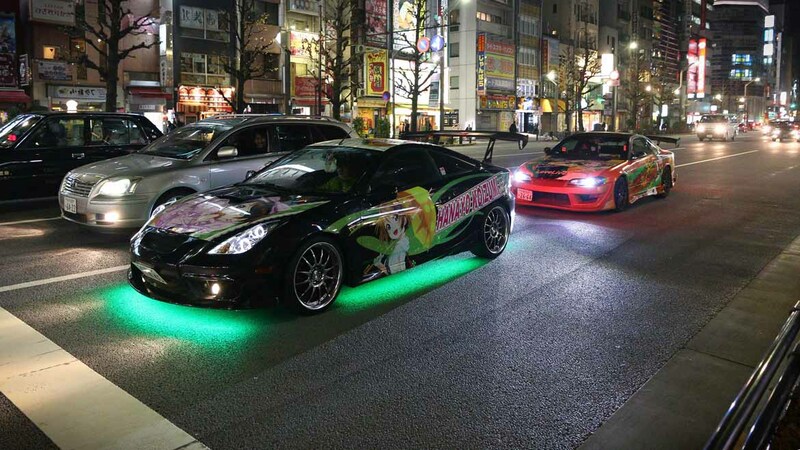 Whatever you think of the itasha, you can’t help but admire their community. They are also really friendly, so don’t be afraid to ask them about their cars or manga.